Here at CA, we are big fans of attaching our feet securely and safely to the pedals of our bikes. That way, we get maximum possible forward motion from the energy we put in and can forget about slipping off and concentrate on cycling. We have tested road-style clipless pedals and shoes previously here at CA, but some riders prefer the off-the-bike security and ease of movement given by pedals and shoes with cleats hidden below the level of the tread. 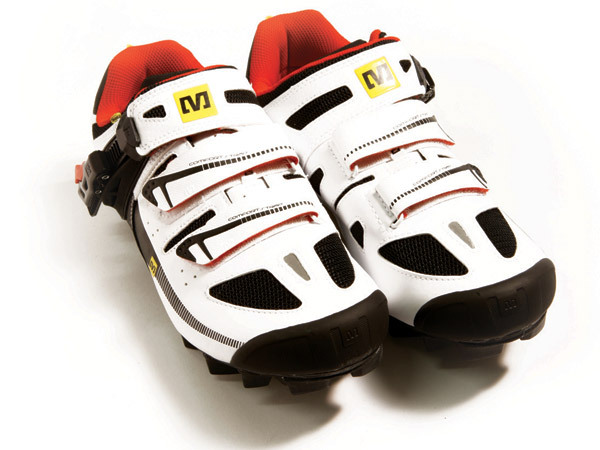 Usually referred to as mountain bike shoes, this type of footwear is actually very practical for a large majority of riders. With the smaller cleat recessed within a pocket in the tread, wandering around towns, cafes and anywhere else is far more elegant, lacking the ‘walking like a duck’ sensation that comes with traditional road shoes. 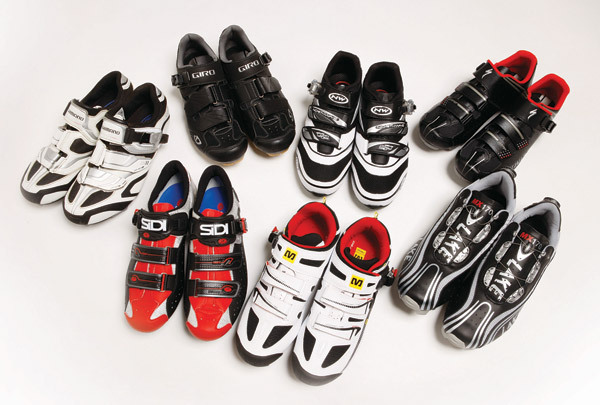 The sole is stiffer than that of a regular shoe, which enhances power-transfer to the bike and stops the foot getting overly tired as a result of wrapping around the pedals as you press on. 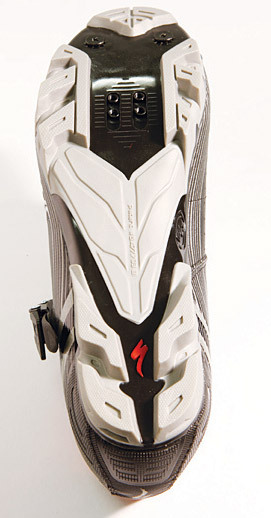 Even so, the front of the shoe will have a little give in order to facilitate off-the-bike movement. As well as the obvious testing on the bike, we wore the shoes to the corner shop, and threw in some mountain biking to make sure they can cope with anything. That said, we have marked them primarily as a shoe to be used for riding on the road, and for moving around on foot. We’ll mention if they are suited to multi-sport use, but we have majored on tarmac suitability. The ability to make small but secure adjustments to the tension of the shoe is vital. If each click of a ratchet is too big, you’ll quickly end up with a lack of circulation in your toes, and that is no fun. It’s also worth making sure that any straps or retention systems don’t put undue pressure on any lumps or bumps of your feet. As well as having a deep-enough pocket to fully hide the metal cleat from contact with the ground — avoiding the potential slipping and wear that ensues if the cleat protrudes — there are a couple of other things to look for. The middle of the foot — where your arch is — needs to have some grip too. If you miss entry into your pedal and this section of sole is just plastic or carbon, you can quickly slip forward and off the pedal, ending up raking your shin along the spiky pedal face or impaling your softer regions on the stem. Many companies will scrimp on insoles for shoes, as they are hidden inside and not really thought about. While many people will have no problems with wafer-thin insoles, something with more support can save your feet from hot spots and unnecessary aches. There is no disputing the fact that the Privateer has classy, understated looks, and is the least ‘superhero’. It has a synthetic leather upper, and natural, dual-density, gum-coloured sole. It quickly found favour among the understated testers. Thankfully, the performance was far from underwhelming. It isn’t race-shoe stiff, but was among the best here at transferring power to the pedals while maintaining enough give that your heel doesn’t pull out when walking around. At cafe stops, we did knock the ratchet adjuster once on a table leg, releasing it accidentally, but on a bike this was never an issue. Much like the Northwaves, you’ll either love or hate the XC50’s Stormtrooper looks. Aesthetics aside, these were jointly the stiffest-soled shoes on test. If you are after something focused more on bike time, with the ability to wander around, rather than an all-round usable piece of footwear, the Shimanos should be near the top of your list. The other great thing about the XC50 is the tread pattern. Plenty of midsole texture prevents slipped pedal nightmares, and the clearance around the cleat pocket was very good, making them a great multi-discipline choice. Uniquely here, the Northwaves are actually designed specifically for the sort of riding we suggest mountain bike shoes are great for: a mix of bike and walking time. Visually, we would have thought something subtler would suit this application, but taste is personal. What is clearly evident, however, is the emphasis on off-the-bike comfort. The Fondos are almost slipper-like in comparison to some. The forefoot is very flexible, meaning the shoe flexes almost like a trainer between ball and toes. On the bike, this is not so great but, as ever, it’s horses for courses. The BG in the title refers to Specialized’s Body Geometry concept. The forefoot of the shoe is canted a couple of degrees, as the US company has found this more readily represents the human body’s natural stance for a huge portion of people. On the bike, the shoes are undoubtedly comfortable, and offer a lot of instep support. They do suit riders with narrower feet, but there are many fans of BG shoes in the CA offices, both beginners and high-end racers. The BG Comp simply carries on with that theme. The Rush undoubtedly has the visual styling of a road racing shoe. For many riders, looking the part is as important as anything else — and avoiding looking as though you’re in an MTB shoe is a bonus that’s therefore to be welcomed. The low-profile tread pattern is responsible for a lot of this, but the performance matches up. Sitting a notch below the Lakes, they are great on and off the bike stiffness-wise, and the straps and ratchets do a great job of spreading pressure. Even the insole is a step above anything else on test. With a black and grey version also available, what’s not to like? Here at CA, we like to chuck in a curve ball, to see what a bit more expense gets you. Sidi is renowned as a classic Italian brand of quality footwear, and the Eagle 5 Pro sits mid-range in the company’s line-up of bike shoes. It shares the same quality upper and replaceable parts as more expensive models, which is what you pay a premium for. The fit and conformity of the Lorica material is exceptional. Durablity is excellent and with ratchets and buckles serviceable, so the cost per wear soon falls. The sole is no stiffer than the cheaper shoes, but that suits mixed use. Fit is narrow; wider-footed riders could swap to the Mega version of the Dominator 5 for £10 more. The Lakes eschew two straps and a ratcheting buckle for closure, choosing instead a ‘Boa’ system, consisting of a wrapped metallic lacing system that threads and crosses over the foot, tensioned via a rotating dial on the rear of the shoe. It spreads the pressure very evenly over the shoe, and there are fewer tight spots, as the upper is able to move a little as you pedal, while still maintaining overall security. With a sole matching the Shimanos for power-transfer, these are a natural choice for riders, not walkers, since the hard-compound tread transfers stones and gravel through to the foot very readily. We have many great shoes in this test, but it’s a group that can be split dependent on your exact needs and styling preference. The Sidi is a long-term investment but is definitely a step up in terms of comfort; Specialized BG shoes are just a great all-rounder, and the only reason not to choose them is sartorial taste. Giro’s Privateers, on the other hand, work well, offer decent performance and found particular favour for their good looks. If they fit the shape of your feet, however, there was an easy winner on performance. The Mavics were good for walking, as were the flexible Northwave Fondos, but the former were also as good as the best on the bike, and they look like a road shoe, so suit the purist, and don’t cost the earth. Job done, in our book — chapeau to the folk from Annecy.